It was tighter than I like making the plane due to 30 minute line for bag drop-off (this is after checking in and paying online). Then the security line was across the skybridge (if you’ve ever been to the San Diego airport you know this is very long!). They called my flight to the front of the line which only meant you waited about 15 minutes instead of 30. By the time I got to my plane all rows were boarded and I ran on. We landed at JFK 30 minutes early but there wasn’t a gate for us so we went to the “pad” where we were transported by people mover to the terminal. I met two bloggers in the people mover but forgot to get their cards (and I ran into them a second time at Queerosphere). My mistake regarding transportation was arranging for Supershuttle in advance. I waited 25 minutes for them and 2 hours later I got to the hotel (multiple terminal and hotel stops). The conference organizers sent badges (and drink coupons) to registrants pre-conference so I just had to pick up the badge holder, lanyard, and conference bag (shown above). The line was extremely short and I had received my first “swag”. Swag is products given away to attendees of the conference and parties. The bag included conference friendly items like a notebook, pen, card holder, water bottle, alarm clock and more. My brother and sister joined me for a siblings get away and have cocktail passes. I think they’re going to start blogs and come as full registrants next year. There were parties, parties, and more parties last night. Three were official and at the hotel and many more were privately sponsored at offsite locations. I turned down invites to the Bumble Bee and Martha Blogger party because our dance card was full. After a quick change and freshening we headed to the Social Luxe Lounge. I’ll take a picture of my swag bag later but it was full of great stuff. We got this at the door along with a name badge and lanyard and one drink coupon (which I didn’t find until later in the evening). We picked up the binders we designed in advance online and sponsored by Avery. Other products onsite were International Delight, Ghiradelli, Crayola, Frito-Lay and Stride-Rite. Waiters passed appetizers and we headed to the primping area where my sister had a manicure and I had the neck/back massage. Wonderful! They were also doing pedicures and make-up. We left sooner than we wanted to head to New York City Mama’swax party at Madame Tussauds. She had great food and drinks where we got to see the amazing replicas of so many notable people. We left after a quick snack and tour to head back to the hotel and drop our “heavy” bags. Instead of heading to the Schick Intuition party (with performance by Gavin DeGraw) we hit two official parties. The People’s Party was 2/3 over so I didn’t get to meet the Blogess but I enjoyed a drink named Pink Twitter. Queerosphere was a great way to have a sweet treat before retiring for the evening. They had finger sandwiches, fruit and beautiful chocolate shells filled with mousse and fresh berries among other treats. While chatting in our room with soft drinks there was a knock after 10 pm. It was the bellman with a swag drop. There was a Mr. Potato Head, a metal water bottle and a bag that included coupons and a travel computer mouse. Who knew you get gifts delivered to your room? This was just my first day; I can’t wait to find out what tomorrow brings. I loved your update. Makes me feel like I’m there too. Can’t wait to hear about the Swag – looking forward to the rest of the updates. Kelly, the swag is unbelieveable! I’ll share a few pictures tomorrow. Sounds busy & fun! I didn’t know the blogher conf is in NYC (just across the river from me) but don’t think I would have gone anyway. I’m not a serious blogger. It is very busy! Caffeine and the energy of the conference is keeping me going. We are newbies to BlogHer and didn’t get to the registration fast enough, so I am going to have to live vicariously through you and the other bloggers! Great first post, make me feel like I am there! I’m glad you enjoyed it Beverly. I’ll be covering day two soon! This sounds like a lot of fun. I’m glad that we get to read about your experience. Hopefully, you will get a another chance to network with some more very cool bloggers as you did at the Savvy Blogging Submit. I will do highlights of the next two days of the conference. It was a lot of fun and a totally different experience than the Savvy Blogging Summit. That sounds like fun. I hope you have a big suitcase, it sounds like you are going to need it. I didn’t have enough luggage for the products. But will tell more later. 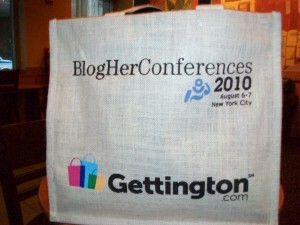 Sounds like BlogHer is quite an experience! I love hearing all the details from you -it’s definitely making me more interested in going next year! Jen, I’m very glad I came but even more happy I first attended Savvy Blogging Summit which was more intimate and focused on learning. Thanks, Jane. I loved the smell of the oils/lotions from the massage! I can’t wait untl next year.